Louis IX, Roi de France was born on 25 April 1215 at Poissy, Île-de-France, FranceG.3 He was the son of Louis VIII, Roi de France and Blanca de Castilla.2,3 He married Marguerite de Provence, daughter of Raimond Berengar V, Comte de Provence and Beatrice di Savoia, in 1234.4 He died on 25 August 1270 at age 55 at Tunis, TunisiaG.3 He was buried at Saint-Denis, Île-de-France, FranceG. Louis VIII, Roi de France was born on 5 September 1187 at Paris, FranceG.2 He was the son of Philippe II Auguste Capet, Roi de France and Isabelle de Hainaut.2 He married Blanca de Castilla, daughter of Alfonso VIII, Rey de Castilla and Eleanor Plantagenet, on 23 May 1200 at Normandy, FranceG.2 He died on 8 November 1226 at age 39 at Auvergne, FranceG.2 He was buried at Saint-Denis, Île-de-France, FranceG. Blanca de Castilla was born circa 1183 at PalenciaG.2 She was the daughter of Alfonso VIII, Rey de Castilla and Eleanor Plantagenet.3 She was also reported to have been born in 1188. She married Louis VIII, Roi de France, son of Philippe II Auguste Capet, Roi de France and Isabelle de Hainaut, on 23 May 1200 at Normandy, FranceG.1 She died on 1 December 1252 at Paris, FranceG. 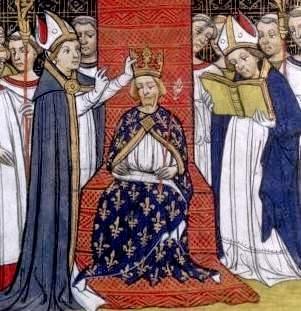 Charles IV, Roi de France was born circa 1294. He was the son of Philippe IV, Roi de France and Jeanne I, Reina de Navarre.1 He married, firstly, Blanche de Bourgogne, daughter of Otto IV de Bourgogne, Comte de Bourgogne and Mahaut d'Artois, between 1306 and 1307. He and Blanche de Bourgogne were divorced in 1322. He married, secondly, Marie de Luxembourg, daughter of Henri VII de Luxembourg, Holy Roman Emperor and Marguerite de Brabant, on 21 September 1322 at Paris, FranceG. He married, thirdly, Jeanne d'Evreux, daughter of Louis de France, Comte d'Evreux and Marguerite d'Artois, in July 1325. He died on 1 February 1328 at Vicennes, FranceG. He was buried at Saint-Denis, Île-de-France, FranceG. He was a member of the House of Capet.1 Charles IV, Roi de France also went by the nick-name of Charles 'the Fair'.1 He succeeded as the Roi Charles IV de France in 1322.1 He gained the title of Roi Charles IV de Navarre. He was a member of the House of Plantagenet. [S31] Bernard, Sir Burke, editor, Burke's genealogical and heraldic history of the landed gentry of Ireland, 4th ed. (London, U.K.: Burkes Peerage Ltd, 1958), page 4. Hereinafter cited as Landed Gentry of Ireland. [S38] John Morby, Dynasties of the World: a chronological and genealogical handbook (Oxford, Oxfordshire, U.K.: Oxford University Press, 1989), page 112, says 1246. Hereinafter cited as Dynasties of the World. [S11] Alison Weir, Britain's Royal Families: The Complete Genealogy (London, U.K.: The Bodley Head, 1999), page 62, says 1234. Hereinafter cited as Britain's Royal Families. Sancho III, Rey de Castilla was born circa 1134. He was the son of Alfonso VII, Rey de Castilla and Berengaria de Provence.2 He married Blanche de Navarre, daughter of Garcías IV, Rey de Navarre and Margaret de l'Aigle, in 1151.2 He died on 31 August 1158. He succeeded as the Rey Sancho III de Castilla in 1157.